Today I am doing a mani inspired futuristic fashion. Basically when looking that up you see a lot of pieces with geometric designs so that is what todays is. Plus it has a boatload of flakies so lets look! This mani was actually on my Instagram story last week because I had 2 different flakie polishes I wanted to use and couldn't decide which one to use. So I wait for the poll to come in for a good 20 minutes and ya know what?! It was tied so I just began and used BOTH! LOL! So basically I started with a gold polish base, then I sponged on some China Glaze Luxe & Lush which was really gloopy and thick. Turned out that it didn't sponge well either. It just makes a textured mess and since I wanted to put on a vinyl I just used the Color Club Snow-Flakes. After that I used a vinyl from Snail Vinyls that ya'll can find HERE. Psssttttt..... They are called Space Age Stencils! How fitting! I put on black and then decided to go over everything again with the Color Club flakies. They just shifted so nicely that I couldn't resist. Above are all of its different shifts! Now that concludes this post! I think they came out pretty fun. However the CG that I did sponge on made my nails really snaggy so I may just have to part with that one since it was so goopy and well it is from the Hunger Games collection. So its a pretty old polish when you think about it. Hope you all enjoyed this song, I mean post. Hummm thats what happens when you are typing and talking to someone about the song that is playing in the back ground. If you were wondering its Last Young Renegades by All Time Low! Honestly I was just thinking about all of the CD's that have been released this year and then I was trying to figure out what ones were in my "Top" and I was surprised to realize there haven't been that many this year. Only about 3 CDs that were like "Must haves" which is weird. Its been an interesting music year to say the least! Oh well we are totally off topic! I will talk to y'all tomorrow with another futuristic look. Plus my favorite part of the song is almost on! Wow, those flakies show off tons of color! I love the use of space age stencils with the flakies! Such a cool design! Thank ya, and right?! I was surprised, it had been so long since I used them so I totally forgot! This is so pretty and I seriously need that Color Club! Thank you! Its one of my fave flakies! The flakes add so much. I had some from Sally's years ago that I couldn't get enough of. What a fun design. Thank you! I think these Color Club flakies were a close dupe for the Sally ones or maybe it was for Essie Sign of the Times? I like the depth and layering of this nail art. I love how it looks stamped over the flakies. It gives a multi-dimensional look. I actually used a vinyl for this! It was so quick and easy! Love the stamping over flakes! So cool! It was actually a vinyl, it made it to be such a quick look! 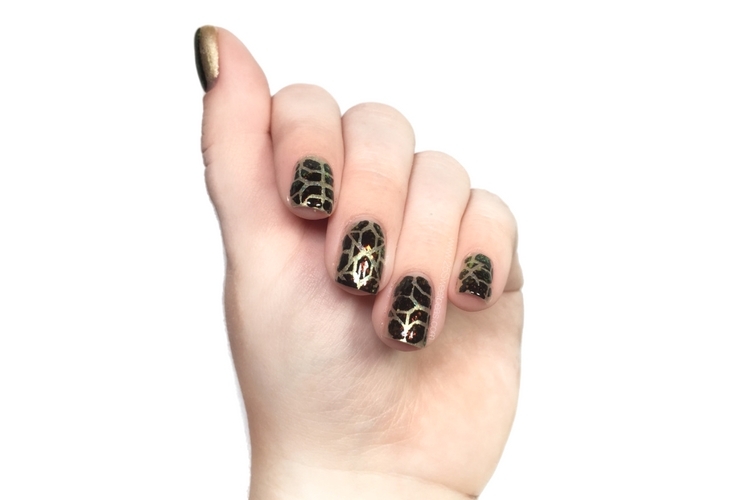 Boo for goopy China glazed but this mani came out awesome! Right?! I might have to get rid of it, sponging didn't even really help. This is really pretty, I like how it turned out. I love how those flakes pop through! Gorgeous! Paint With Me | Snowflake Edition!